The Topaz IDGem LCD 1x5 RF has been discontinued. No direct replacement is available. Designed for use in environments where security or identity verification are a top priority. The IDGem LCD 1x5 RF combines Topaz"s trusted electronic signature technology with a state-of-the-art electronic fingerprint sensor. 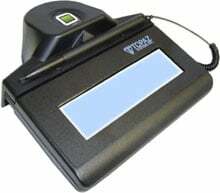 Perfect for applications in which identity verification, access control, or check-in is required. Powerful bundled software includes SigPlus tools and plug-ins and SigID software for fingerprint capture, recognition, and scoring. The IDGem LCD 1x5 RF features a patent-pending design that allows ergonomic and natural finger and thumb scanning from the front of the pad without awkward movement. The LCD provides electronic ink under the pen tip as you are signing. Tempered glass with active pen, USB (HID Compliant), RF Sensor Technology. Bundled with SigPlus and SigID, Pro developer tools, plug-ins.